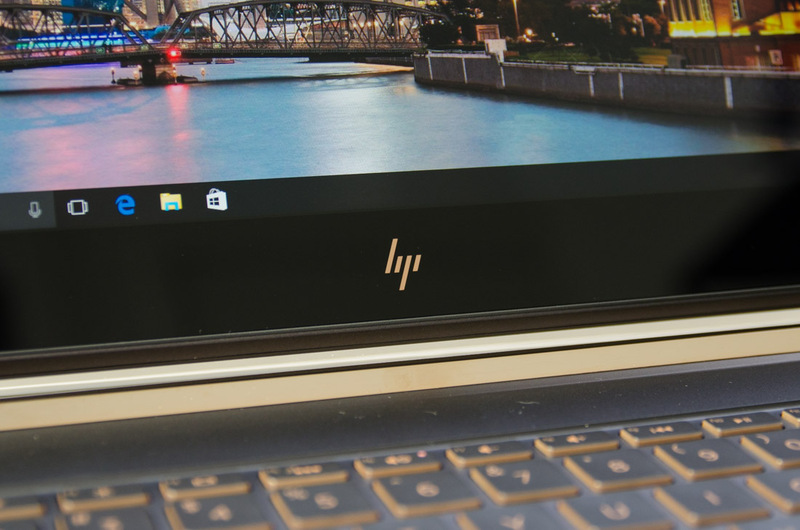 HP has been one of the most prolific PC companies throughout the Windows era, sitting at the top of most market share charts for the past ten years. 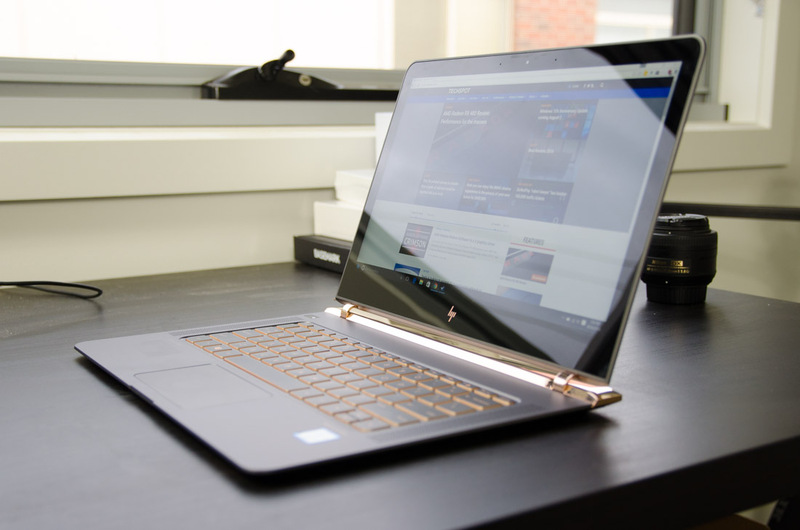 But despite this dominance, HP hasn’t been known for its beautiful laptop designs, instead relying mostly on functionality and performance to sell its products in large numbers. The HP Spectre deviates away from this philosophy, and it might just be the best laptop the company has ever created. The Spectre is a thing of beauty. At 10.4mm, it’s the world’s thinnest laptop, edging out Apple’s 12-inch MacBook by a few millimeters. It’s also very light for a 13-inch device, at just 2.45lbs (1.1 kg), making it a perfect companion for the businessman on the go. And the design itself is truly unlike any Windows laptop I’ve seen before, thanks to a breathtaking hinge and use of premium materials. Prospective buyers will glad to hear that HP hasn’t compromised on internals either. HP offers standard Intel Skylake Core i5 or Core i7 processors inside the Spectre – none of this underpowered Core M stuff – along with a PCIe solid state drive and a collection of the latest USB Type-C ports with Thunderbolt 3. Battery life is an alleged nine hours as well, from a 38 Wh integrated battery. I’ll talk more about the hardware in the Spectre later though, because the real star of the show is the design. It’s taken companies a long time to realize how exactly to compete with Apple’s clear design advantage, but in recent years we’ve seen Lenovo, Dell, and HP create products that really stand up against the polished and well-built looks of MacBooks. The Spectre features a fantastic complementary color scheme that’s one of the best I’ve seen this year. 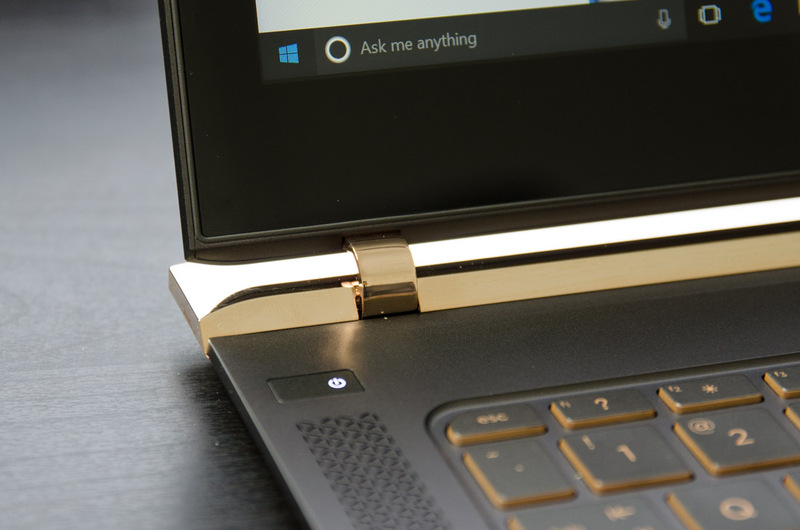 Most of the body is constructed from a classy black-brown metal, with copper-gold highlights that make this laptop stand out. The gold looks superb alongside the base black-brown color, especially as part of the hinge assembly and around each keyboard key. The hinge is one of my favorite aspects to the Spectre’s design. 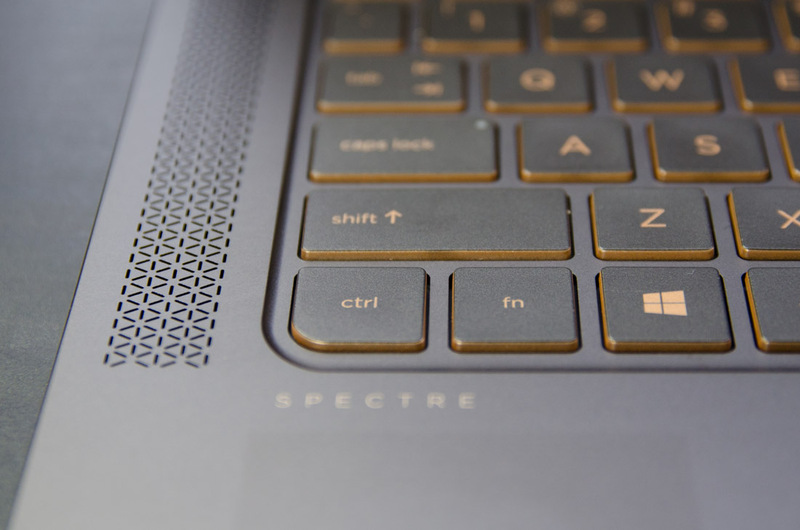 Instead of the lid attaching to the back edge of the laptop, like many other models on the market, the Spectre’s lid separates from the base a few centimeters before this back edge on two thin, curved hinges. When opened, the lid sits about 5mm above the base with a clear gap between them, giving the illusion that the display is floating above the laptop’s bottom section. The two hinges slide carefully into a large gold section that occupies the entire rear edge of the Spectre. The glossy metal finish looks spectacular – it complements the rest of the metal body so well – but it is a huge fingerprint magnet and requires constant cleaning to look at its best. When you do clean it, along the back edge you’ll find a subtle Spectre logo, which is one of my favorite aspects to the entire design; it just adds that little extra touch. All ports on the Spectre are found along the back edge. This may not be the most convenient location while you’re using the laptop, but it’s clearly a trade-off to keep this device so slim. 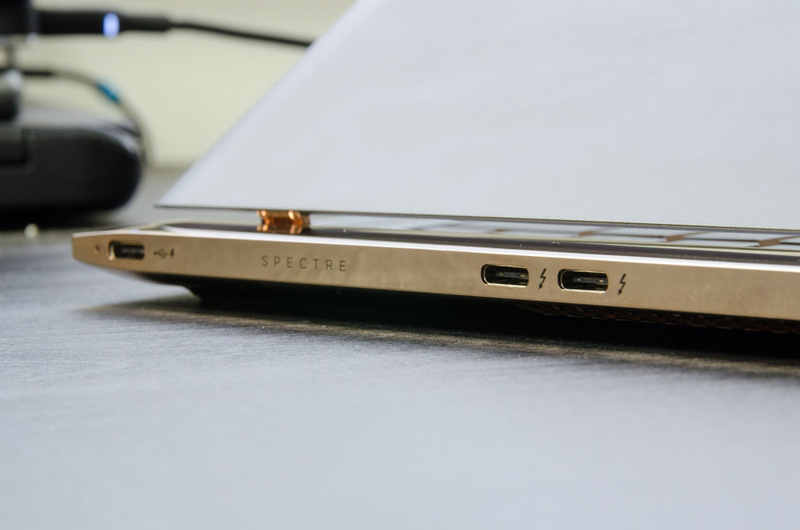 The Spectre only features USB Type-C ports along with a 3.5mm audio jack, although unlike Apple’s MacBook, HP was clever enough to include three Type-C ports. So yes, you can easily charge this device and connect an accessory without the use of a dongle. Two of the USB-C ports are Thunderbolt 3 capable, situated towards the center of the laptop. On the left is a standard USB 3.1 Gen 1 port. Charging is facilitated through USB-C, and any of the three ports can be used, which is exactly how the standard should work. The lack of a standard USB-A port is somewhat annoying considering most current accessories will still use the larger USB port, but HP does include a USB-C-to-A adapter in the box. 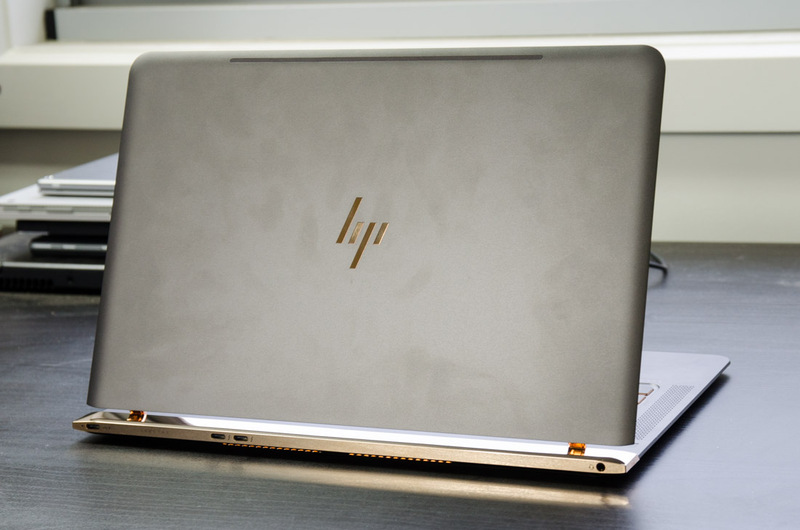 This laptop is so slim that a full-sized USB port would have barely fit along the rear edge so we like how HP has compromised to make it all work. For those wanting to use external displays, you’ll also need to pick up something to transform USB-C to HDMI for use with today’s monitors. Due to the use of standard Core i5 or i7 CPUs, the Spectre includes a small fan to cool the processor when it’s running at maximum performance. The fan intakes air from small grates on the bottom, and vents out two attractive grills along the back edge. When the Spectre is running intensive workloads, the fan can get pretty noisy, but I didn’t notice it the vast majority of the time. It’s also worth talking about the new HP logo. It looks fantastic, and revitalizes the brand for this flagship product. A smaller version is seen below the display as well, protected by a glossy slab of Gorilla Glass. The speakers that come with the HP Spectre are branded as Bang & Olufsen, though I don’t think they sound significantly better than any of the laptops I’ve reviewed recently. There’s a serious lack of bass, and high frequencies are quite pronounced, although midtones and human dialogue sounds quite good. The Bang & Olufsen software utility included does improve audio quality, particularly in films when set to movie mode, though the music mode doesn’t transform the Spectre into even a half-decent music player.